Accidents can happen. 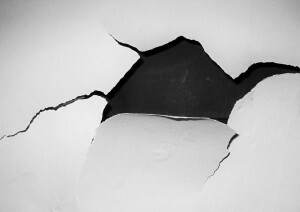 Unfortunately, some accidents can leave a hole in your drywall. If that's happened in your home recently, here are some tips on how you can repair the mishap on your own. The first step is to get your materials for this restoration project. You'll have to acquire: a repair patch that can cover the hole, drywall compound, a putty knife, sandpaper, paint, and a paintbrush. Before you begin, prepare the area so you don't ruin your furniture and floors. Place plastic covers over them so you can keep them protected. Since this can get messy, you should also prepare yourself for the task. For instance, wear appropriate clothing that you can get very dirty for this. You also have to clean the damaged area: remove the loose pieces, wipe down the spot, and try to make the hole as flat as you can. The next step is to patch the hole with the repair patch. Make sure to cover the entirety of it, and to follow the instructions to attach the piece properly to the wall. After that, you will need to use the drywall compound and spread it all over the patch. While you're at it, try to make the surface as even and smooth as possible. If you weren't very successful at making the surface flat, use sandpaper to rub the repaired area and make it mix well with the rest of the wall. Finally, you just need to paint the area, so that you can complete the restoration process and pretend that this mishap never took place at all. If your house requires professional property restoration in Stormville, call Zott Construction DKI at (845) 227-4141 to request a free estimate.